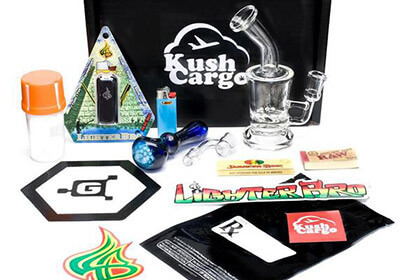 Kush Cargo is a real smokers’ paradise that offers the coolest accessories, incredible glass, and an impressive selection of all sorts of items that you may need to enhance your smoking pleasure. It offers 3 subscription types, designed for smokers with different needs and budgets. The most affordable subscription plan is the Carry-On Cargo subscription, which costs only $10 per month and brings you all the essential smokers items. It includes 3-5 dab or nug related products. The OG Cargo box is designed for smokers who expect a bit more from their boxes. It includes up to 6 dab or nug related products and its retail value is at least $45. The price of the subscription is $22 per month. The First Class Cargo is the most luxurious Kush Cargo box. It includes up to 10 nug or dab related items and its retail value is never less than $120. The price you pay for your subscription is $83 per month. All the boxes include limited-edition items from the best brands in the business and they also come with discreet shipping. The boxes are normally shipped on the 20th of the month, apart from the Carry-On Cargo boxes, which are shipped on the 25th. If you have missed a box you would love to have, you can purchase past boxes in the Kush Cargo online shop. There you can also find a range of cool extras and gifts, including rolling paper gift sets, dab gift sets, bubblers and bongs, hand pipes, dab gear, vaporizers, hemp blunts, rolling papers, and dab torches. Our ratings are the result of an objective and independent evaluation of Kush Cargo, generating the final rating that reflects the overall quality of the product. Ratings may change as the service changes. Kush Cargo user rating based on 5 user reviews. I ordered a rig. After q few days of hearing nothing I emailed customer service. They then let me know the item was out of stock and asked if I wanted a refund or a new product sir no additional charge. I asked for the new product. I got an email saying item delivered. I checked everywhere it was not. I emailed customer service they said they would speak with the post office. They said they did and the package was delivered correctly. If that was the case then I would have it now. I asked for a refund because at this point i am fed up. And now no one from customer service seems to be able to email me back. I will not be doing business with your company again. Ordered a hat, paid for 2-5 day shipping. After tracking showed on the 5th day it was still not in transit, I emailed customer service for a status update. They emailed back saying we have been trying to get a hold of you and that item is out of stock. Would you like a different item, uh no I would like a full refund. First and and last order, buyer beware. Kush cargos' customer service is VERY BAD .DO NOT DO BUISNESS WITH KUSH cargo! I ordered 1 glass piece, for a very special occasion,I PAID FOR 2 DAY SHIPPING , 6... count them 6 days later, it HAD NOT even left their store. Their website is nearly IMPOSSIBLE to navigate , There is literally NO place to find "my account" on thier website! Getting ANY INFO ABOUT WHERE MY ORDERS WERE WAS NEARLY IMPOSSIBLE Now here, I am REQUIRED TO LEAVE AT LEAST 1 STAR, OYHERWISE I WOULD GIVE THEM O.
There’s no Kush Cargo coupons or discounts right now.